Brittany Brie has an incredible passion and love for movement. She has studied dance for over 20 years, and currently teaches pilates and reformer classes in York Region. Her passion, experience and love for helping others have inspired her to develop classes that will challenge and motivate you to move. Her main goal as an instructor is to provide you with the knowledge and confidence to move your body, all while having a smile on your face. 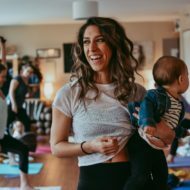 Brittany Brie is very excited to educate the new mothers of West End Mammas through The Bump Method program, featuring Pre & Postnatal Pilates classes. She spends many nights coaching, inspiring and leading a team of fierce female dancers in the Army of Sass dance program. When Brittany is not in the studio, you can find her on an open lake using her paddle board, eating cupcakes, or listening to music while entertaining friends!